Say hello to you new favorite guitar anti-hero. 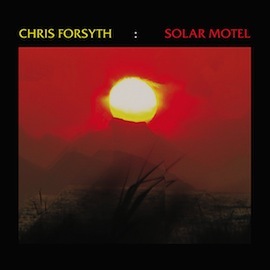 Granted, Chris Forsyth has been making music for quite some time now, but if there’s any justice in this world, Solar Motel will bring a legion of fresh followers into the fold. The album is some kind of masterpiece, a four-part suite of ecstatic, spiritual psychedelia that splits the difference between unabashed classic rock thrills and a spikey avant garde sense of adventure. Try to imagine Television circa 1977 recording a cover of Pharoah Sanders’ “The Creator Has A Master Plan” and you’re halfway there. The late rock critic Robert Palmer wrote extensively about about the Church of the Sonic Guitar, a alternative, six-string tradition that includes such mavericks as Lou Reed, Tom Verlaine (and his partner in crime Richard Lloyd), Robert Quine, Sonic Youth and many more. Forsyth definitely worships at this church, funneling the fluid lyricism of Verlaine, Richard Thompson, and even Jerry Garcia through the feedback-drenched noise rock of the 1980s and 90s. It’s an ambitious approach that not many players could pull off, but Forsyth does it with the ease and dynamism of a virtuoso. His tones shimmer and shatter, resonating beautifully from moment to moment. As great a guitarist as he is, however, Forsyth’s real strength might lie in the architectural nature of his songwriting, as he and his band patiently build up majestic sound structures, only to gleefully demolish them in bursts of cacophony. And then they do it all over again. Solar Motel‘s four parts are composed with an expert’s eye for detail, while still leaving plenty of room for live wire spontaneity and excitement. What I now want for Christmas, basically. Love this. Philly jam, too! Yes! Truly remarcable sound and compositions. Made my day: just noticed he’s playing live here in geneva next saturday! Thank you t wilcox & ad!